Revealed: The EXACT Secrets Implemented By the Ultra-Successful! You hear it all the time: people talking about their big plans for the future. They plan to take wonderful trips to adventurous places. They hope to write a book. They'd like to move into a more comfortable house in a picturesque neighborhood. These people – and maybe you're one of them – dream and wish and hope, but never quite achieve the milestones they’ve always wanted to. They live lives of quiet desperation, constantly wishing for better… but never actually making it happen. Because they don't have the right tools to guarantee their success. Without the right tools, even your best efforts can go awry when hit with the inevitable road blocks, obstacles, and detours. On the other hand, when you have the right tools, and know how to use them, you become unstoppable - as you finally realize your unlimited potential. My comprehensive "Maximum Achievement Training Kit" contains everything you need to guarantee YOUR success. It's the culmination of my 20 years' of research into a "success system" I could share with the world, and you can order your copy right now! Are you ready to experience "Maximum Achievement?" And of course, your investment is covered by my Iron-Clad, 100% Satisfaction Guarantee. That is, you can buy the package, and try the lessons, strategies and ideas I outline in it for a full year. If, within a year, you don't believe it's worth the investment, return the programs for a full refund. No questions asked. 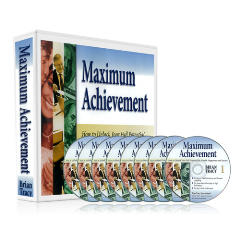 Order your copy of the "Maximum Achievement Training Kit" today! If you've been looking for a way to jump-start your life, this training kit is it. And if you've been looking for the inspiration and motivation to FINALLY begin achieving the big dreams and plans you've created for yourself, this training kit can help you make them a reality. Order your "Maximum Achievement Training Kit" today! If you're not happy then neither are we. My friendly staff will cheerfully return your money and we'll still be friends. That's it. *Note: This refund policy is applicable to physical programs only. Digital and downloadable programs are not eligible for refund after they have been accessed. This includes downloadable/digital mp3s, ebooks, PDFs, and e-learning courses.